You may not think much about the stamps you use for mail—generally anything in stock at the post office will do. 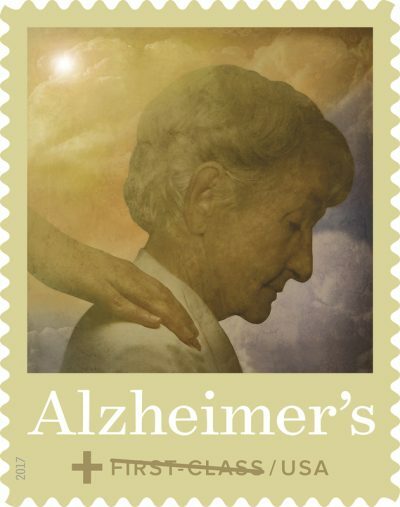 However, with the Alzheimer’s semipostal fundraising stamp, you’re not just getting postage: You’re getting a story. That’s because this stamp is the culmination of two individuals’ hard work and determination to raise funds that will help scores of people affected by the disease that changed the trajectory of their lives. Kathy Siggins first noticed there was something wrong with her husband, Gene, when he went the wrong way on the highway after stopping for gas during a routine road trip. Years later, in 1990, he was diagnosed with Alzheimer’s. In 1994, Siggins began to juggle caring for her husband with advocacy work and to help raise money for an Alzheimer’s cure. She started telling her story at events and heading a local walk team through the Greater Maryland Chapter of the Alzheimer’s Association. After her husband passed in 1999, Siggins decided to ramp up her advocacy efforts when someone mentioned how successful the breast cancer stamp had been as a fundraising vehicle. This began her long journey of lobbying lawmakers on Capitol Hill, writing letters to post office decision makers, and getting signatures to demonstrate the interest and importance of an Alzheimer’s fundraising stamp. Siggins made some progress when USPS issued a commemorative stamp in 2008, but she went through several setbacks in her quest to get a fundraising stamp produced—not the least of which was the suspension of the federal program that allows semipostal stamps to be issued by the post office. “Every so often, I would get into that slump of ‘I don’t think anybody really cares’ then I’d get a call from someone I didn’t know, and they would thank me for what I was doing and just tell me their story—and that was enough to know I was doing the right thing,” said Siggins. Lynda Everman was one of those people. After losing her own husband, Richard, to Alzheimer’s in March 2012, she also got the idea for a fundraising stamp and through her research, found Siggins and approached her on Facebook. The two women found that they shared similar experiences, along with the same passion to raise money for a cure. Siggins and Everman joined forces in sending letters of support for the stamp to Congress and the Postmaster General; in November 2017, their dream was finally realized, and the stamp was made available for sale. Since its release, there have been three million Alzheimer’s stamps sold, raising $471,000 for National Institutes of Health research. Although they have come a long way, Siggins and Everman are working toward extending the life of the stamp—currently scheduled to go out of circulation in late 2019—and spreading the word through their own individual efforts. Siggins still organizes her local Alzheimer’s walk, where she is affectionately known as “the stamp lady,” and has raised $92,000 to date. Whenever she’s involved in any event, she makes a point of selling stamps there, or working to organize a USPS table where the stamp can be sold. Similarly, Everman promotes the stamp through her Facebook community, Help Stamp OUT Alzheimer’s, which has 9,000 active members. In addition, she has founded three networks through UsAgainstAlzheimer’s—WomenAgainstAlzheimer’s, ActivistsAgainstAlzheimer’s, and ClergyAgainstAlzheimer’s—to raise funds and awareness about the disease. Leaders at senior living communities can help promote the Alzheimer’s stamp in several ways, according to Siggins and Everman. First, communities can buy the stamp to use on their own correspondence, so they can raise money for research while supporting those living with the disease. In addition, communities with gift shops can make the stamp available for sale so family members, as well as their own staff, can also pass on the message of hope it represents—a message that Everman says really needs to be heard.